Die Mercurii, 17 Octobris, 18 Car. IIdi. And that it be referred to Mr. Millward, Sir Edm. Pearse, Sir Charles Harbord, Sir Robert Holt, Sir Wm. Lowther, Sir Solom. Swale, Mr. Westphaling, Mr. Crouch, Sir Rowland Berkley, Sir Thom. Allen, Sir Robert Barneham, Sir Robert Carre, Dr. Burwell, Colonel Reames, Mr. Daniell, Mr. Chetwin, Sir John Heath, Mr. Devereux, Mr. Cheyne, Sir Thom. Clifford, Sir Robert Atkins, Sir Wm. Lewis, Mr. Coventry, Sir Thom. Gower, Sir Jo. Lowther, Mr. Morice, Mr. Sandys, Mr. Prynn, Sir Edw. Masters, Colonel Birch, Sir Jo. Birkenhead, Sir Wm. Gaudy, Sir Wm. Doyley, Mr. Hobby, Sir Thom. Higgons, Mr. Mountague, Mr. St. John, Mr. Herbert, Sir Phill. Musgrave, Colonel Strangwaies, Sir Thom. Littleton, Mr. Seymour, Sir Richard Oateley: And they are to meet on Friday next, at Two of the Clock in the Afternoon, in the Speaker's Chamber: And to send for Persons, Papers, and Records. The House then resolved into a Committee of the whole House, to proceed in the Debate of the effectual raising Eighteen hundred thousand Pounds for his Majesty's Supply. Mr. Milward took the Chair of the Committee. Mr. Milward reports that the Committee of the whole House had made some further Progress in Debate of the Manner of raising the King's Supply: And desired, that, as soon as the Message, sent from the Lords, was over, the House would again resolve into a Committee, to proceed in the Debate. 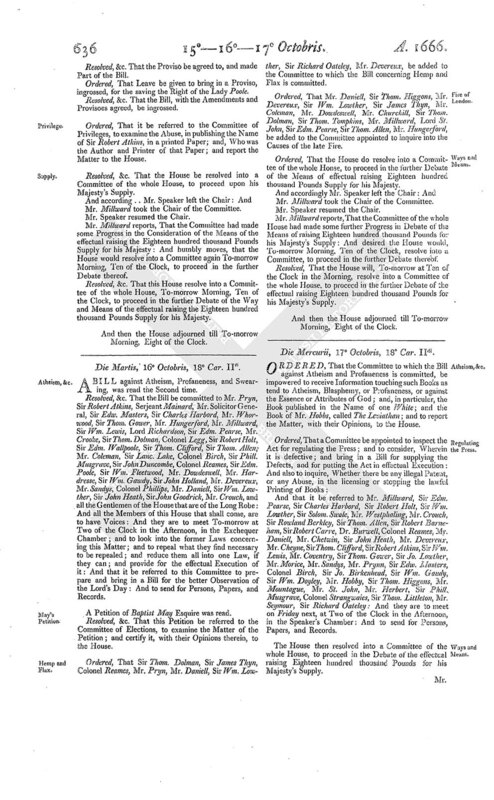 Resolved, &c. That the House will, after Order taken in Relation to the Message from the Lords, again resolve into a Committee of the whole House, to proceed in the Debate of the Manner of raising the King's Supply. Mr. Speaker, The Lords desire a present Conference with the House, in the Painted Chamber, upon the Vote of this House, to which the Concurrence of the Lords was desired, touching the prohibiting the Importation of French Manufactures and Commodities. The Messengers being called in; Mr. Speaker acquaints them, That the House had agreed to a present Conference. Ordered, . . . . Serjeant Charlton, Sir Robert Atkins, Sir Geo. Downing, Sir Thom. Clifford, Mr. Solicitor, Mr. Seymour, Mr. Millward, Sir Robert Howard, be appointed to manage the Conference. Mr. Solicitor reports from the Conference, That they had attended the Lords: And that the Lord Anglesey did manage the Conference; and had delivered several Reasons in Answer to the Vote of this House: Which (to prevent Mistakes) he had also reduced into Writing; and delivered the Paper at the Conference: Which Mr. Solicitor read; and after, delivered the same in at the Clerk's Table. Resolved, &c. That the Answer of the Lords to the Vote of this House, to which the Lords Concurrence was desired, be taken into Consideration on Friday Morning. The House then resolved into a Committee of the whole House. Mr. Millward took the Chair of the Committee. 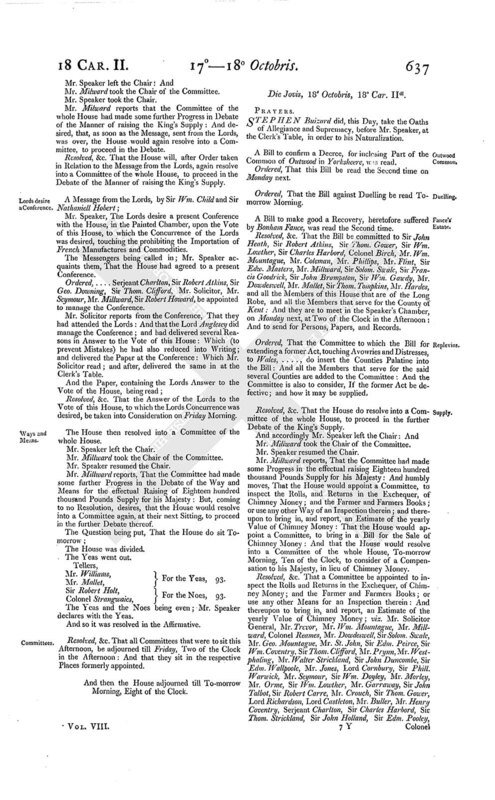 Mr. Millward reports, That the Committee had made some further Progress in the Debate of the Way and Means for the effectual Raising of Eighteen hundred thousand Pounds Supply for his Majesty: But, coming to no Resolution, desires, that the House would resolve into a Committee again, at their next Sitting, to proceed in the further Debate thereof. Mr. Williams, For the Yeas, 93. Sir Robert Holt, For the Noes, 93. The Yeas and the Noes being even; Mr. Speaker declares with the Yeas. Resolved, &c. That all Committees that were to sit this Afternoon, be adjourned till Friday, Two of the Clock in the Afternoon: And that they sit in the respective Places formerly appointed.